describe future trends in information systems. Information systems have evolved at a rapid pace ever since their introduction in the 1950s. Today, devices that we can hold in one hand are more powerful than the computers used to land a man on the moon. The Internet has made the entire world accessible to us, allowing us to communicate and collaborate with each other like never before. In this chapter, we will examine current trends and look ahead to what is coming next. The first trend to note is the continuing expansion of globalization. The use of the Internet is growing all over the world, and with it the use of digital devices. 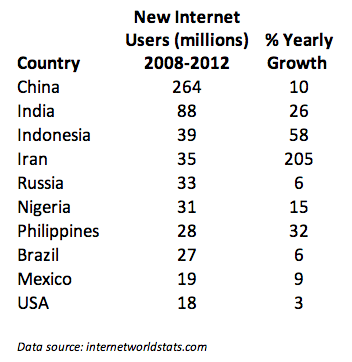 The growth is coming from some unexpected places; countries such as Indonesia and Iran are leading the way in Internet growth. Besides Facebook, other social media sites are also seeing tremendous growth. Over 70% of YouTube’s users are outside the US, with the UK, India, Germany, Canada, France, South Korea, and Russia leading the way. Pinterest gets over 50% of its users from outside the US, with over 9% from India. Twitter now has over 230 million active users. Social media sites not based in the US are also growing. China’s QQ instant-messaging service is the eighth most-visited site in the world. Ever since the advent of Web 2.0 and e-commerce, users of information systems have expected to be able to modify their experiences to meet their personal tastes. From custom backgrounds on computer desktops to unique ringtones on mobile phones, makers of digital devices provide the ability to personalize how we use them. More recently, companies such as Netflix have begun assisting their users with personalizations by making suggestions. In the future, we will begin seeing devices perfectly matched to our personal preferences, based upon information collected about us in the past. Mobile device sales. In 2011, smartphones began outselling personal computers. The number of smartphone subscribers grew at 31% in 2013, with China leading the way at 354 million smartphone users. Internet access via mobile. In May of 2013, mobile accounted for 15% of all Internet traffic. In China, 75% of Internet users used their smartphone to access it. Facebook reported that 68% of its active users used their mobile platform to access the social network. Wearables have been around for a long time, with technologies such as hearing aids and, later, bluetooth earpieces. But now, we are seeing an explosion of new wearable technologies. Perhaps the best known of these is Google Glass, an augmented reality device that you wear over your eyes like a pair of eyeglasses. Visible only to you, Google Glass will project images into your field of vision based on your context and voice commands. 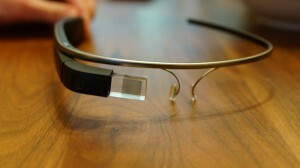 You can find out much more about Google Glass at http://www.google.com/glass/start/. Another class of wearables are those related to health care. The UP by Jawbone consists of a wristband and an app that tracks how you sleep, move, and eat, then helps you use that information to feel your best. It can be used to track your sleep patterns, moods, eating patterns, and other aspects of daily life, and then report back to you via an app on your smartphone or tablet. As our population ages and technology continues to evolve, there will be a large increase in wearables like this. As more of us use smartphones and wearables, it will be simpler than ever to share data with each other for mutual benefit. Some of this sharing can be done passively, such as reporting our location in order to update traffic statistics. Other data can be reported actively, such as adding our rating of a restaurant to a review site. The smartphone app Waze is a community-based tool that keeps track of the route you are traveling and how fast you are making your way to your destination. In return for providing your data, you can benefit from the data being sent from all of the other users of the app. Waze will route you around traffic and accidents based upon real-time reports from other users. Yelp! allows consumers to post ratings and reviews of local businesses into a database, and then it provides that data back to consumers via its website or mobile phone app. By compiling ratings of restaurants, shopping centers, and services, and then allowing consumers to search through its directory, Yelp! has become a huge source of business for many companies. Unlike data collected passively however, Yelp! relies on its users to take the time to provide honest ratings and reviews. One of the most amazing innovations to be developed recently is the 3-D printer. A 3-D printer allows you to print virtually any 3-D object based on a model of that object designed on a computer. 3-D printers work by creating layer upon layer of the model using malleable materials, such as different types of glass, metals, or even wax. In a nutshell, the term “Maker” refers to a new category of builders who are using open-source methods and the latest technology to bring manufacturing out of its traditional factory context, and into the realm of the personal desktop computer. Until recently, the ability to manufacture was reserved for those who owned factories. What’s happened over the last five years is that we’ve brought the Web’s democratizing power to manufacturing. Today, you can manufacture with the push of a button. The “Internet of Things” refers to the idea of physical objects being connected to the Internet. Advances in wireless technologies and sensors will allow physical objects to send and receive data about themselves. Many of the technologies to enable this are already available – it is just a matter of integrating them together. Tracking behavior. When products are embedded with sensors, companies can track the movements of these products and even monitor interactions with them. Business models can be fine-tuned to take advantage of this behavioral data. Some insurance companies, for example, are offering to install location sensors in customers’ cars. That allows these companies to base the price of policies on how a car is driven as well as where it travels. Enhanced situational awareness. Data from large numbers of sensors deployed, for example, in infrastructure (such as roads and buildings), or to report on environmental conditions (including soil moisture, ocean currents, or weather), can give decision makers a heightened awareness of real-time events, particularly when the sensors are used with advanced display or visualization technologies. Security personnel, for instance, can use sensor networks that combine video, audio, and vibration detectors to spot unauthorized individuals who enter restricted areas. Sensor-driven decision analysis. The Internet of Things also can support longer-range, more complex human planning and decision making. The technology requirements – tremendous storage and computing resources linked with advanced software systems that generate a variety of graphical displays for analyzing data – rise accordingly. Process optimization. Some industries, such as chemical production, are installing legions of sensors to bring much greater granularity to monitoring. These sensors feed data to computers, which in turn analyze the data and then send signals to actuators that adjust processes – for example, by modifying ingredient mixtures, temperatures, or pressures. Optimized resource consumption. Networked sensors and automated feedback mechanisms can change usage patterns for scarce resources, such as energy and water. This can be accomplished by dynamically changing the price of these goods to increase or reduce demand. Complex autonomous systems. The most demanding use of the Internet of Things involves the rapid, real-time sensing of unpredictable conditions and instantaneous responses guided by automated systems. This kind of machine decision-making mimics human reactions, though at vastly enhanced performance levels. The automobile industry, for instance, is stepping up the development of systems that can detect imminent collisions and take evasive action. A final trend that is emerging is an extension of the Internet of Things: autonomous robots and vehicles. By combining software, sensors, and location technologies, devices that can operate themselves to perform specific functions are being developed. These take the form of creations such as medical nanotechnology robots (nanobots), self-driving cars, or unmanned aerial vehicles (UAVs). A nanobot is a robot whose components are on the scale of about a nanometer, which is one-billionth of a meter. While still an emerging field, it is showing promise for applications in the medical field. For example, a set of nanobots could be introduced into the human body to combat cancer or a specific disease. In March of 2012, Google introduced the world to their driverless car by releasing a video on YouTube showing a blind man driving the car around the San Francisco area. The car combines several technologies, including a laser radar system, worth about $150,000. While the car is not available commercially yet, three US states (Nevada, Florida, and California) have already passed legislation making driverless cars legal. A UAV, often referred to as a “drone,” is a small airplane or helicopter that can fly without a pilot. Instead of a pilot, they are either run autonomously by computers in the vehicle or operated by a person using a remote control. While most drones today are used for military or civil applications, there is a growing market for personal drones. For around $300, a consumer can purchase a drone for personal use. As the world of information technology moves forward, we will be constantly challenged by new capabilities and innovations that will both amaze and disgust us. As we learned in chapter 12, many times the new capabilities and powers that come with these new technologies will test us and require a new way of thinking about the world. Businesses and individuals alike need to be aware of these coming changes and prepare for them. Which countries are the biggest users of the Internet? Social media? Mobile? 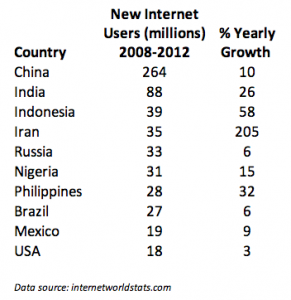 Which country had the largest Internet growth (in %) between 2008 and 2012? How will most people connect to the Internet in the future? What are two different applications of wearable technologies? What are two different applications of collaborative technologies? What capabilities do printable technologies have? How will advances in wireless technologies and sensors make objects “findable”? What is enhanced situational awareness? If you were going to start a new technology business, which of the emerging trends do you think would be the biggest opportunity? Do some original research to estimate the market size. What privacy concerns could be raised by collaborative technologies such as Waze? Do some research about the first handgun printed using a 3-D printer and report on some of the concerns raised. Write up an example of how the Internet of Things might provide a business with a competitive advantage. How do you think wearable technologies could improve overall healthcare? What potential problems do you see with a rise in the number of driverless cars? Do some independent research and write a two-page paper that describes where driverless cars are legal and what problems may occur. Seek out the latest presentation by Mary Meeker on “Internet Trends” (if you cannot find it, the video from 2013 is available at http://allthingsd.com/20130529/mary-meekers-2013-internet-trends-deck-the-full-video/). Write a one-page paper describing what the top three trends are, in your opinion.